See actual network state on graphic map! Scan your network, discover hosts & topology. Manage and access hosts faster using map. Monitor switches, UPS, door sensors, temperature, and voltage via SNMP. Receive e-mail, SMS, sound notifications on failures. 10-Strike LANState is a visual network mapping, monitoring, and management software. This simple NMS allows you to perform the network management, monitoring, and administration. You can easily scan your network, find all devices, add them to the network map, and configure the program for monitoring your switches, UPS, networking equipment, servers, and workstations. Access and manage your hosts faster using the graphic network map. Download free 30-day trial version and try the program. LANState scans the network topology automatically, and generates a graphical map, which speeds up accessing to remote hosts' properties and resources, and managing those. Scan your LAN or add important hosts manually to the network map and monitor their operation. You can add any host, device, or server to your map, draw lines and areas, add text labels and background images for better visual appearance. The program can export the network maps to graphic images, Microsoft Visio documents, and XML files. The Pro version contains a built-in web server so remote users or you can connect to your workplace and see the network map displaying the actual devices' states (on / off) using your mobile device. The program is very easy to configure and setup everything. After the network scan, the program starts monitoring each found host using the ICMP ping check (by default). You can easily add more checks, change monitoring settings, or enable the alert notifications. Add more checks to monitor your databases, servers, switches, printers, etc. The program handles almost 30 monitoring checks for various networking protocols and services. These include: SQL, HTTP, FTP, POP3, SMTP, etc. 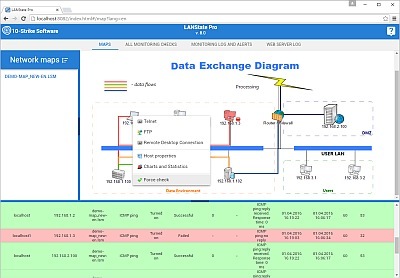 LANState can monitor various parameters on network devices via SNMP and SNMP traps. You can monitor managed switches (temperature, CPU usage, disk space), routers, UPS (voltage), optic and cable equipment (signal level), printers (toner level), door and rack sensors, etc. Thanks to the graphical map, you can see results of the monitoring checks on a graphical map in the real time. Active hosts with successful checks will be displayed highlighted and the failed ones will be shaded. You can just click a tray icon at any time, and see on the visual map which servers and switches are operating and which went down and are not responding. The program records all the monitoring parameters' values (if this is voltage, temperature, free disk space, or the signal level). If you just monitor the host's availability, the program will record the response times. You can always watch and analyze these statistics diagrams and trends finding bottlenecks and predicting potential problems. Configure alerts and receive email or SMS notifications when something goes wrong on your LAN when some host or service goes down before anyone notices. Employing LANState makes it essentially easier to administer and monitor processes in networks of any ranges or sizes. You can download free 30-day trial version and try the program on your network. LANState builds a network map automatically by scanning Windows network neighborhood or IP address range. Links are gathered from managed switches via SNMP and LLDP. Save your network map for future use, print it, or export to a bitmap file. Be notified by background device monitoring via a screen message, sound, or e-mail notification when your servers go down or recover. The package does not require installing any components on remote servers and workstations. Link external applications like file managers or remote administration software to the program and run them in a couple of clicks on the desired map host. Import custom backgrounds for more evident network map's look. Access and manage remote devices in a couple of clicks, using LANState's visual network map. You are able to shut down, restart, turn on servers and workstations, access remote host's services and shares, view remote event logs, access the remote registry, list processes, devices, and services running, and so on. Export network maps to Microsoft Visio (in LANState Pro only). Access your network map remotely via the HTTP protocol using the built-in web server, and export the network map to xml file format (LANState Pro). The program contains many useful tools for administrators, such as network scanner, TCP port scanner, ping, trace route, name lookup, etc. The program is easy and simple to use. A detailed help system is available. 1) We have released the all new vector graphic engine with vector re-sizeable icons. Now you can scale your map and devices as you want. 2) We also completely re-designed the map editor and improved the visual alerting. Failed devices are now painted in red color. 3) The web UI was updated to support the new vector icons and graphics. The LANState software has two editions: Pro and Standard. Please read the versions' feature comparison if you do not know which version to choose. 1. LANState Pro is the most advanced version of the program, which contains a built-in web server which provides a web UI for remote users. With its help you are able to install the software on a single computer, so users and administrators will be able to see which hosts are on and off using their web browsers only. You may consider purchasing one copy of LANState Pro instead of several copies of LANState. LANState Pro allows exporting network diagrams to Microsoft Visio, supports larger map sizes, retrieves SNMP data, builds switch connection tables and exports it to CSV files. 2. LANState Standard or just LANState is a network mapping, monitoring, and management solution, which has built-in Windows administration features. It is missing the advanced SNMP functions, map exporting to Visio, and the web UI. LANState Pro 7 is a finalist for the 2014 Network Computing Awards. The program was nominated for the "New Product of the Year" Award category by the "Network Computing" magazine (UK). 10-Strike LANState in PC Magazine/RE in annual software review "Best of Soft 2005": "It is not so mighty and "heavy" as HP OpenView, but it is quite functional and easy to use. The software provides automatic forming of a network map, and allows organizing server and workstation monitoring, provides basic remote management facilities..."
Scott M.: "I was very impressed with the amount of control that the software could give you over a network that I am managing. I was testing a number of other mapping software at the time but none could do what LANState pro could do." Andrew H.: "I also wanted to tell you how much I like the ability of importing previous scans into a current scan. This program has been the most valuable network tool I have used yet." Joe B.: "I have been using LANState for a month now, and it has allowed me to fix the network issues before users realize something happened. It keeps my VPN connections up and allows me to monitor and access the printer server's and workstation resources all from one place. I have 109 network entities listed so far and will be adding another 35 later this month. Your software has saved me hours of work being able to work from my desk instead of going to different buildings and offices to access the resources. The ability to keep my VPN connections alive 24/7 is a blessing in itself. I highly recommend the software." Ivan S.: "Thank you very much. Your LANState is the best! Now, I know exactly what happens on my network at every moment. It is very simple to manage all computers using your program. LANState combines a friendly interface and many necessary features for the network administration and management." Renato M.: "Many thanks for your excellent support. Actually it works very fine and it even finds the unmanaged switches (hub) in between; it is a wonderful tool." Arthur B.: "After conducting an extensive search for software that would automatically detect network devices, and then produce a network diagram to graphically represent the network layout, we found LANState Pro. 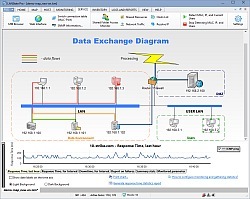 This software saves time and money producing professional network schematics with ease. LANState Pro provides not only a snapshot of the network but also the details such as IP, MAC, and status information at the touch of a button. From a security point of view it also allows the client to see who is connected to the network to assist in preventing unauthorised access. Simply a great product. Thanks." 10-Strike LANState review at 3d2f.com: "The most intelligent tools are the ones that provide methods for network visualization and mapping. Such tools make the network management a very easy and vivid job. Perhaps, one of the newest and comfortable network mapping tools is 10-Strike LANState..."
Network mapping: modeling a local area network in a visual mode and then saving the result as a map, image, XML scheme. You can print the network map, or export the network map to Visio. Network diagram: Draw a network diagram and export it to Visio. Monitor servers and other hosts. The following monitoring checks are supported: ICMP monitoring,TCP port monitoring, DNS monitoring, ARP and MAC address monitoring, SNMP monitoring, FTP monitoring, HTTP monitoring, SSH monitoring, WMI monitoring, NetBios monitoring, service monitoring, process monitoring, folder monitoring, file monitoring, file size monitoring, disk space monitoring, printer and toner level monitoring. 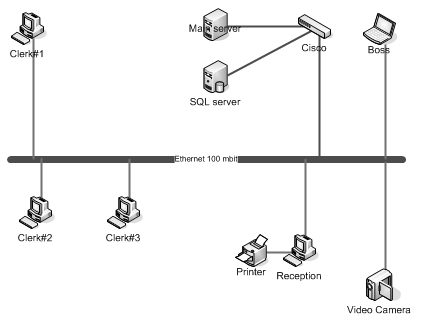 Obtaining information on remote computers: IP address, current user, accounts and groups, domain, server, operation system used, current date and time, MAC address, shared resources, connected users, registry, services and devices, processes running, event log, installed software, SNMP information. Connection monitoring (monitoring usage of your shared resources by other users of the network) with logging, sound and screen notification, and blacklists. Network traffic monitoring (incoming/outgoing traffic and transfer rates). Searching hosts by ICMP ping or scanning TCP ports. Scanning network by IP address range. Controlling access permissions for your shared resources. Pinging any computer on the network. Retrieving computer's network name by its IP address. Sending regular and anonymous messages to any computer on the network. Shutting down and restarting any computer on the network (when required permissions are granted on the remote computer). Turning on remote computers (wake-on-LAN). Notifying of events by playing a sound, writing to log, running program, sending e-mail, etc. Performing actions on network devices via the configurable context menu. If you like this program or if you want us to add some features, we would be glad if you send an email to us. Bug reports will be appreciated too. You can send your feedback to us here.